Hello crafty friends! Today’s project is part of a very special blog hop collaboration with Pretty Pink Posh & WOW! Embossing Powder! As with any fun blog hop, there are some great prizes so be sure to comment for your chance to win! Let’s begin! First, I stamped the beautiful Pretty Pink Posh Hummingbird Thanks images with Versamark onto Bristol smooth card stock. I covered the images with WOW! Embossing Powder in Rose Glitz (which is a very cute pink gold pretty true to rose gold) and heated it with my heat gun until the images were smooth and melted. I then did the same process with Pretty Pink Posh Flourishing Fuchsias stamps. I colored all the images with Zig Clean Color Real Brush Markers and die cut them with their coordinating dies. Next, I ink blended my background with Distress Ink and splashed water on top for some interest. I let this dry and heat emboss the sentiment from Encouraging Greetings in the same WOW! Rose Glitz embossing powder. This embossing powder is a gorgeous metallic pink color. I love it! I adhere all the images onto foam tape and arranged it onto my A2 card. To finish the card, I adhere Pretty Pink Posh rose gold sequins. These matched the embossing powder perfectly! This card is relatively simple with a lot of impact due to the beautiful images and gorgeous rose colored embossing powder! That’s it for my card! Please continue hopping along with the amazing designers below. Thi <– You are here. 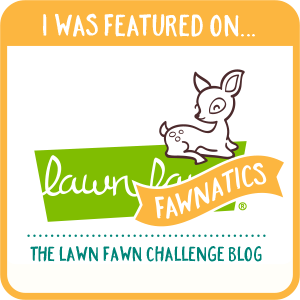 No blog is complete without some fun prizes! Are you ready for this? WOW! Embossing Powder – Any 6 powders from your choosing along with a WOW carry case to store your proders safetly. All you have to do to enter is leave a comment on each of the design team members’ blogs! Winners will be chosen at random from comments left on all blogs on the blog hop by 6:00 AM PST on Sunday, July 29th. Winners will be announced on the Pretty Pink Posh and WOW! Embossing blog. I adore the color scheme! I have a similar set if not that very one… I’m going to have to try this Now, thank you! Love this! I have wanted those specific hummingbirds for awhile. I’ve seen others by other companies but the PPP ones are my FAVORITE! Such subtle colors, who wouldn’t want to receive this card. Beautiful! This is soooo pretty! Thank you for inspiration. Adorable! Love the soft colors you chose! Love these colors of embossing powder! they are so beautiful! Very pretty card with lovely soft colors. So nice & soothing card! Love it. Oh my goodness, you have used the most beautiful, soft colors on this to give it such a peaceful feeling. It’s wonderful! So delicate just like the humming birds on your card! LOVE the rose gold embossing powder! the hummingbirds and fuchsia stamps are a perfect combination for this pretty card. Wow, Thi! Your color choice is beautiful ad unique! I really like this card. There is beauty in simplicity. This card really proves it. Thanks for sharing a real wonder. Hummingbirds and fuschias make a great pair, but the Rose Glintz EP really adds class. Lovely card, Thi! Gorgeous card! Such a fantastic soft and sweet color palette. Beautiful placement of your elements. Gorgeous!!! This is so pretty! OH I lve this color combo! MAGNIFICENT CARD! I just LOVE those Hummingbirds and Fuschias! The colors you chose for them are absolutely gorgeous!! And the background AWESOME! AWESOME! Love the soft colors, your card is so pretty! Your card came out so cute, what a great combination of colors and stamps/diecuts! Such a pretty card. I love rose gold so this is definitely a favorite. The soft colors are just so pretty. Oh my!!! It’s truly adorable!!! Love beautiful soft pastel colors!!! Awesome card! Beautiful background and composition. Love the ink blended background. And the images are so pretty against it. Adore this beautiful card! 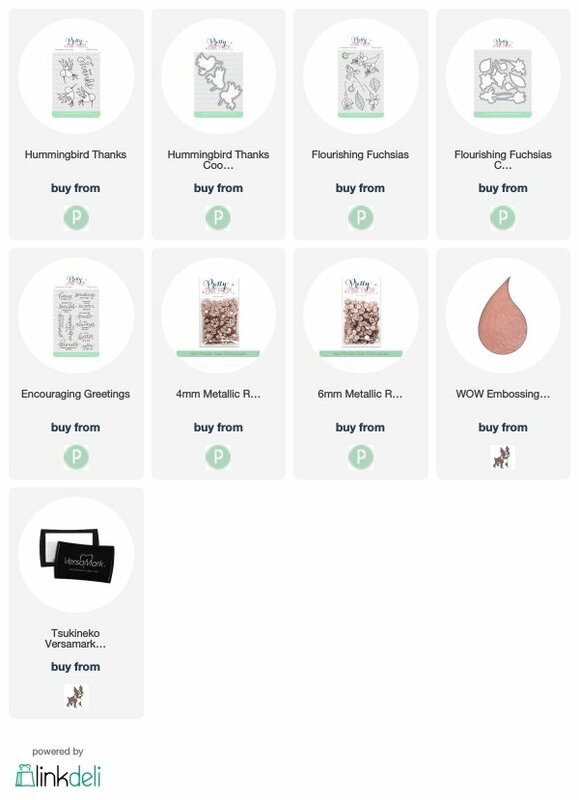 I haven’t seen the embossing powder in Rose Gold yet, just added to my wish list! Your ombre card is so pretty. Very lovely. I just love the hummers and those flowers. Wow! This is a beautiful color combination! I love the pretty rose gold shades, and they blend so perfectly too! Very pretty! Pretty card! Love the flowers and hummingbird stamps and the beautiful color of the embossing powder! Enjoying this collaboration hop and seeing all the projects along the hop! These colors are perfection. Love hummingbirds and with fushias, more beautiful…..
Beautiful card! I love how soft the colors look! Soft, beautiful and fantastic!! Love this! I love the pastel/soft colors! SO pretty! Such a pretty card and I love the colors! Love your beautiful card. The embossing adds such a nice touch. Wow, the Rose Quartz is so lovely. It’s on my list to purchase now. Wowee! Your card is ever so pretty! The rose gold powder complements the other colours so beautifully. Thank you for sharing! Such a pretty card, gorgeous colour palette too – Love it! Fabulous inspiration on this blog hop! Beautiful card and I love this rose gold color powder. I love how your finished card has such a soft look to it, yet it is still so striking! Thanks for sharing! You are so on trend with the embossing powder that is close to rose gold…gorgeous results with these very pretty fushia images. What a great card! So pretty. Love your creation using hummingbird stamp set. So beautiful, especially being embossed!. Your gorgeous card is so inspiring!! The Rose EP really added to beauty of the hummingbirds and your beautiful coloring! So pretty! The hummingbirds are my favorite PPP set, and I’ve been looking for a rose gold embossing powder. Lovely color combination on your card! Beautiful. The colors are so pretty. Love hummingbirds and these are great. LOVE that embossing powder and it looks perfect with the inking! WOW, amazing, pretty, delicate, sophisticated, colourful card. I hope you get that they really like this card. Stunning card with such a gorgeous colour palette. Thanks for the inspiration. What a gorgeous card !! I love your choice of sweet, soft pastel colors ! So pretty. I like the soft colors. Such a lovely color of embossing powder!